The Company’s current exploration program is focused on the upgrade and expansion of known resources, as well as in the discovery of new deposits. 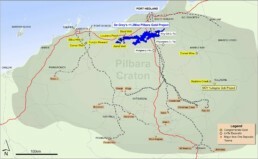 Overall, the Pilbara Gold Project has excellent potential to define significant additional resource ounces along the 200 km plus strike length of mineralised shears zones, throughout the greater than 1,500 km2 landholding. To date, approximately 10% of the shear zones have received detailed shallow RC and diamond drilling to a nominal depth of 100-150m defining ~ 1.4Moz (JORC 2012*) of gold resources (ASX Announcement “Annual Report” 29/10/2018). The extensive strike length of untested and gold anomalous shear zones together with the discovery of gold nuggets associated with previously unrecognised conglomerate targets, is considered by De Grey as one of the most under explored and prospective regions of Australia. The Project is well served by infrastructure, since it is close to the regional centre of Port Hedland, a gas pipeline, two railways and is traversed by the Great Northern Highway.